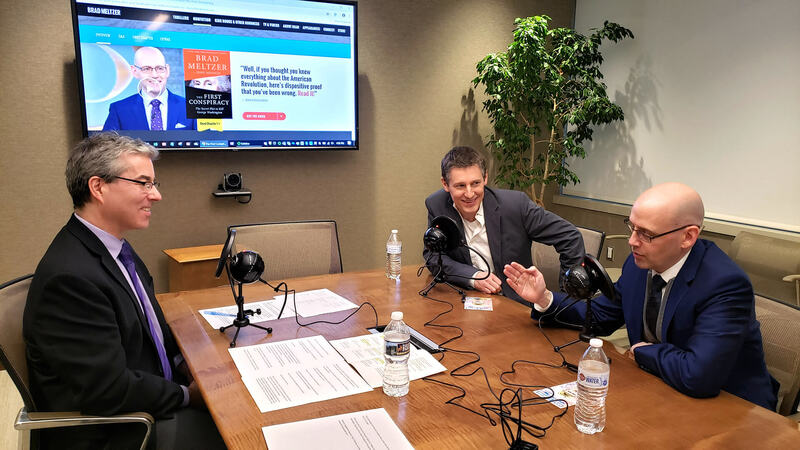 Clockwise from left: AUSA Book Program Director Joe Craig speaks with Josh Mensch and Brad Meltzer, authors of The First Conspiracy: The Secret Plot to Kill George Washington, and the first guests on Thought Leaders, part of AUSA's podcast Army Matters. Did you ever hear about the time that George Washington’s bodyguards planned to kill him? And how he uncovered the plan in the early days of the Revolutionary War and brought one of the soldiers to justice in the largest public execution in America of its time? The story was news to me – but it’s absolutely true. Brad Meltzer – bestselling author of thrillers like The Escape Artist and The Inner Circle and host of History Channel TV shows Brad Meltzer’s Decoded and Brad Meltzer’s Lost History – describes the little-known event in his new nonfiction book, The First Conspiracy: The Secret Plot to Kill George Washington. Meltzer and co-author Josh Mensch recently came to the AUSA headquarters to tell me the story in person. Fortunately, my collegue Edward Kobus was there to record the discussion, and I am proud to announce that the authors of The First Conspiracy will be my first guests on AUSA's new podcast: Army Matters. The podcast series, produced by Carrie Varouhakis and LaSherryn Duncan, launches this month. It offers AUSA yet another way to be a Voice for the Army and provide Support for the Soldier. AUSA’s Army Matters is a mix of four rotating programs: Soldier Today with retired Sgt. Maj. of the Army Ken Preston and retired Command Sgt. Maj. Troy Welch; Army Real Talk with Nzinga Curry and Maj. Brad Cooper; Family Voices: Let’s Get Real with Patty Barron; and Thought Leaders with retired Col. Dan Roper and yours truly, Joe Craig. The Thought Leaders program will feature conversations with people on the leading edge of mili-tary strategy, military operations, and military history. I’ll be speaking with authors like Brad Meltzer and Josh Mensch about their latest books. Not all my guests will be official AUSA Book Program authors, but all will have great Army stories to tell. The plot to kill George Washington qualifies as one of those great stories. Declaration of Independence) and downplayed by a general about to face his enemy (the first wave of the British fleet arrived in New York Harbor the day after the execution), but our leadoff podcast recovers the facts from the depths of history. The AUSA Army Matters podcast is available on iTunes and everywhere podcasts are found. We encourage everyone to subscribe in order to catch all the episodes. For more information, please visit us online at podcast.ausa.org.